October is the month for ghosts, goblins, candy, and fun, spooky surprises. 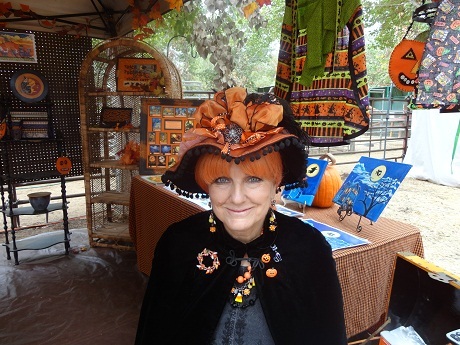 So, meeting artist Sally Bell at the Live Oak Canyon Pumpkin Patch was a special treat for this Halloweenista. 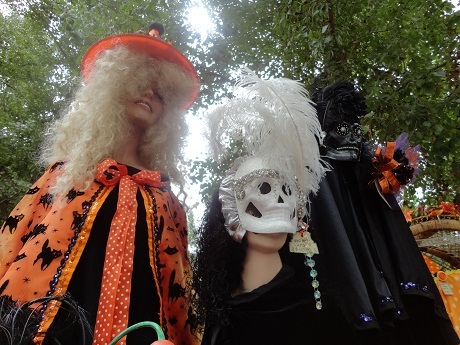 Sally’s pumpkin-orange tresses tucked beneath her awesome witch’s hat and quirky get-up caught my eye. 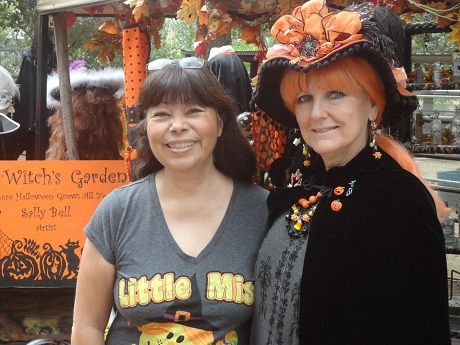 As soon as I stepped inside her crafty booth The Witch’s Garden, I fell under her magic spell. My gaze quickly shifted to the Halloween art sprouting all around me. Beckoning were fantastic images of dancing skeletons, black cats, witches joy riding on broomsticks, lively haunted houses, graveyards, spooky trees, and the legendary Headless Horseman. 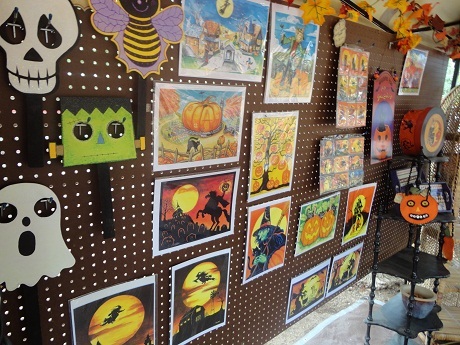 The Halloween scenes are all captured on gourds, hat boxes, original art prints, canvas, and ATC’s (artist trading cards). 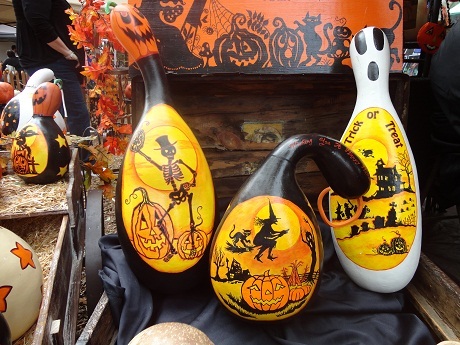 And did I mention she designs cool potion bottles? And all of her prices were in my mad-money price range, so this girl was in Halloween heaven! Sally, who worked for Disneyland, in Southern California, as a decorator and designer inherited her passion for all things creative from her mother. While working for The Mouse, she designed window displays throughout the theme park including the store windows on Main Street U.S.A. The same windows I’ve oohed and awed over for years. I totally love this orange cape with the blact cats! She also designed and installed the uppermost room of the Tarzan Treehouse where her artwork can be enjoyed throughout the attraction. She even painted a picture of herself which sits on the dresser in the Gorilla Room. Sally’s other love—Halloween. She created her first haunted house when she was only twelve years old, and every October she transforms her family’s home into a haunted mansion. I mean, how cool is that? Sally’s artistic motto—if she hasn’t done something creative, she feels the day has been wasted. A good motto to live by. Where are my sticky notes? This writer is jotting that one down and posting it by my computer. It was fun meeting you, Sally Bell! I love your hat. And your artwork is awesome! Stay tuned… tomorrow’s blog will feature close-ups of the artwork we purchased from Sally Bell. This entry was posted in Uncategorized on October 25, 2012 by mariacisnerostoth. I believe you found your Halloween soul-mate, Maria! LOL! She is one lucky lady to be living her dream and doing something she loves so much.